Year-end lists are a pretty self-indulgent thing, assuming that people are suddenly going to care about your opinions if you put them in the form of a numbered list. But so is being meta and self-depreciating, so instead of going through all that mess, I'll just say that 2017 had a lot of incredible movies, and I basically just wanted a chance to write a little bit about the ones I didn't directly review. Let's get this clickbait list started. The original John Wick wasn't something that people saw coming. Out of nowhere, Keanu Reeves was once again starring in one of the greatest action films of the decade, if not the greatest, in a role specifically hand-crafted just for him. The gunplay, the mythos, the style, it was all absolutely brilliant, and it came back with a vengeance in John Wick: Chapter 2. The set pieces are larger, the fight scenes are more intense, the lore of the world of hitmen that Wick lives in becomes even deeper, and John Wick himself is better than ever. Reeves and his co-stars trained even more extensively for this film than the original, and it really shows. Everything is dialed up to 11 in what is just simply an action film that deeply understands what makes action films great. Chapter 3 is already hotly anticipated, and if it pulls off what the first two films have been able to pull off, the John Wick trilogy will end up in the annals of action film history as one of the greatest trilogies ever produced. When people talk about the greatest superhero films ever made, The Dark Knight will always top everyone's list, and perhaps rightfully so. But I hope that history is kind to Logan, because I think that it's a contender for the top. The characters of Wolverine and Professor X have a nearly 20 year long cinematic history, and Jackman and Stewart bring everything they have to their final on-screen appearances as these characters, bringing a humanness to the mutants that we truly have never seen before. The success of Deadpool is probably to thank for Fox allowing a final Wolverine film to be rated R, and thank god, because it allowed the character to be treated with a maturity that it never had before. Logan is a deeply tragic movie, and it has it's share of action sure, but at it's core it is about a man who has lived too long, done too much wrong, and finally finds something that can truly being about his redemption. This is the Logan that the world needed to see in 2017, and I am truly thankful that this movie got made. Taylor Sheridan has definitively made a name for himself in Hollywood, with 2015's Sicario and 2016's Hell or High Water both getting Oscar nods, a surprising achievement for such a new face. With his directorial debut Wind River, Sheridan finishes off his informally named "Frontier Trilogy" in style. This may be his darkest film yet, spending most of the film establishing a slow burn, building the mystery and suspense until, in an insanely well-constructed climactic scene, the tension skyrockets and the horror sets in as our heroes face the evils that men commit. Renner and Olsen do a great job as the main characters, and as usual the writing is top notch. Sheridan stumbles just a little in his directing, but he's clearly learned a lot watching the directors of his previous two movies, and I can tell you that Sheridan's name on a movie will always be enough to get me into the theater. Baby Driver is an absolute blast from beginning to end. It even begins with one of the greatest car chases ever put on film, in one of the best scenes period of this year. It's created with love, made by movie lovers, for movie lovers. It's ridiculous, it's fun, it's crazy, it's dramatic, it's got everything. I've seen it 5 times and no doubt will watch it again and again. Watching gunfights synched up with music will never, ever get old. Edgar Wright has created in Baby Driver a film that the directors of tomorrow will no doubt be ripping off, being inspired by, paying homage to, and mentioning in interviews. It's one of the most successful completely original movies of the year (i.e., not based on a book, part of a franchise, or a sequel), and rightfully so. Baby Driver understands why people go to the movies, to be transported to another world where the right song always plays at the right moment, the snappy one-liners are perfectly timed, and you always, always get the girl at the end. Somehow Darren Aronofsky, most well known for the waking nightmare that is Requiem For a Dream, has in mother! created his most polarizing, controversial, and abstract film yet. Part biblical allegory, part fever dream, the film is a completely unrelenting assault on the senses, growing more and more difficult to reconcile with a logical view of reality as it progresses. A lot of the underlying plot can be understood through a general knowledge of the Bible, but the experience of watching mother! is not one that can easily be quantified or captured. It is above all else an experience, less concerned with straightforward narrative or strict rules of reality, than with manipulating the viewer and taking them on an incredibly harrowing journey. Aronofsky is at his most technically skillful here as well, with the actual film-making being near perfect, with every shot being exactly what it should be, showing the audience nothing more than he wants them to see at any given moment. mother! is a film that I will always defend, despite some of the critics intense dislike of it. The very premise of Shape of Water is enough to put off people I'm sure, Del Toro usually isn't one for easy to swallow plots. But at it's core, beneath the fairy tale sci-fi aspect, beneath the Cold War-era setting, this is a story of a woman who the world sees as broken, finally finding love in someone (or something?) that values her for who she is. It's something that speaks to a lot of people, despite the fact that most people watching this won't be able to relate to Elisa's exact experience. Having a main character that is a mute is actually one of my favorite things about this movie, as it's something that to my knowledge I actually haven't seen before, and Sally Hawkins brings an incredible passion to the character. Watching her sign frantically to her neighbor as she attempts to convince him to help her rescue the creature was a moving experience, as was the entire film. A strange fairy tale to be sure, but at it's core, a story of the unwanted desiring the love that the rest of society seems to take for granted. Dunkirk is a perfect example of what you can create once you have the trust of mainstream audiences. It is no doubt the biggest film of the past several years that has gotten away with being so abstract. The way it plays with time is thrilling, something not immediately obvious from the beginning of the movie, but as it continues forward, and the audience sees events begin to overlap and repeat, it becomes obvious that something odd is going on. It's so insanely creative as an approach to what could have been a straightforward war movie. I suppose it's something that we should expect from Nolan at this point, he always has had an obsession with time, either in terms of editing or as the actual plot. Memento, Inception, and Interstellar all play with time in very unique ways, so Dunkirk doing the same just shows that he clearly knows what he's doing. Combined with the brilliant ticking-clock soundtrack by Hans Zimmer, this is a taught, crowd-pleasing thriller that simultaneously experiements with how we view and understand time. Nolan is a director that will be studied in schools no doubt, and I believe Dunkirk will grow to become one of his best loved films. Three Billboards is a movie I already wrote extensively about, but I really can't give it enough praise. McDonagh's usual stylistic cynicism turns more serious in this film, and it's definitely for the better. There are plenty of laughs to be had, but they're darker, more introspective laughs than even his other films contained. Three Billboards is a movie about America, about the hatred that we all foster within our hearts, and about the brokenness that we're trying to hide with that hatred. Fear, distrust, violence, all of it stems from a deep hurt that we hide inside of ourselves, and Frances McDormand embodies all of it in what I hope to be her second Oscar-winning lead role. The dramatic chops that she and Sam Rockwell bring to their roles are what give the film it's weight and it's urgency, and though it carries a message that will most likely not reach most people, for me at least it's given me something to think about on nights where I lay wondering what's wrong with some of the people I encounter. Perhaps we are all Mildred Hayes, a woman with a fragile heart that must be protected at all costs by the walls of bitterness and animosity that she has erected around it. Lady Bird is a movie that I saw advertised, but honestly did not plan on going to see. Movies like this come out semi-often, and though it looked nice, it wasn't in my list of "movies to see immediately". Once the positive reviews began to flood in though, I made up my mind that I should at least see what the fuss was about. What I got was a movie that was simultaneously hyper-specific, and widely relevant at the same time. How could the experiences of a teenage girl in Sacramento be so relate-able to me? It's all in the script, the framing, the wonderful performance by Saoirse Ronan as the titular character. 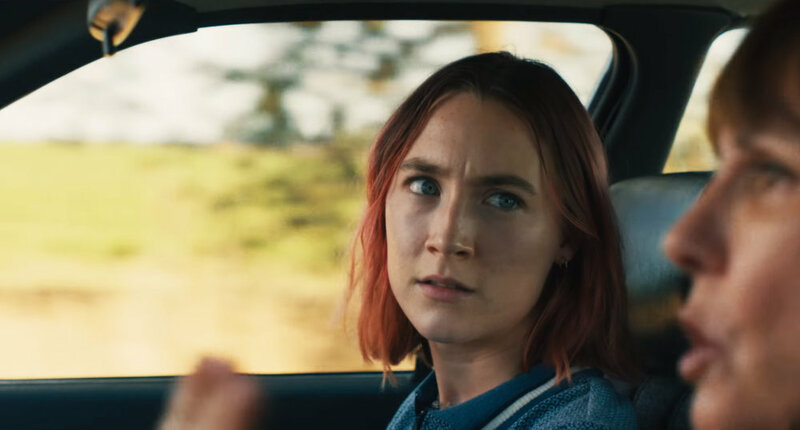 Lady Bird delivers something tender, something so personal and understandable, something that anyone who has been a teenager (and some of us who still feel like we are) can relate to. It's hard to put into so few words the number of moments that I felt a connection to, but this is a movie all about relationships with other people, and how it's never as easy or as fun as movies really try and make it seem. We say things we regret, we get caught in lies, we abandon our friends, we don't say things that we should have. We're all broken people attempting to seem whole. The sooner we all realize that and learn to accept and understand each others flaws, the sooner we can form real connections. This is the central message of Lady Bird to me, and it's something that I think everyone can benefit from understanding. Blade Runner 2049 has it all. Roger Deakins (hopefully) oscar winning cinematography, Denis Villeneuve's expert visual style, Ryan Gosling's brilliant performance as K, a mind-blowing cyberpunk setting grounded in one of the most influential sci-fi films of all time, and a humanistic message at it's core that reaches out and grabs you, and refuses to let go. I've been anxiously anticipating the blu-ray release of this just so I can watch it again as soon as possible, because god, what an experience this was for me. I had high expectations going into the theater, and even then all of them were exceeded. There are so many ways that a Blade Runner sequel could have been ruined, but the film that we got instead of all of those, is an absolute masterpiece. A message about the hopelessness of our generation, wrapped in a genre thriller that you could almost take any single shot from and frame it on a wall. It is a beautiful movie, with flaws no doubt, but so much of it succeeds where it had no right to, and for that I am forever grateful. Blade Runner 2049 is 100% my favorite movie of the year, and I cannot wait to watch it again very soon.